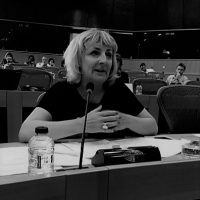 Joanna Maycock is secretary general of the European Women’s Lobby. She has 20 years’ professional experience in senior leadership and governance positions in the European and International Development NGO sector. Before joining the European Women’s Lobby in 2014, she spent 12 years, heading up the ActionAid International office in Brussels and working to fight global poverty and inequality. She was also a long-time board member and formerly President of CONCORD, the European Confederation of Development NGOs. Joanna also previously worked on migrant women’s rights at the International Organisation for Migration.